Nissan is recalling certain model year 2013 Nissan Altimas due to a spare tire issue, which may result in the tire being over-or under-inflated. Affected by today’s recall are 123,308 model year 2013 Nissan Altimas built between March 21 and March 26, 2013. The vehicles in question may contain spare tires that have been considerably over-or under-inflated. As a result, tires that are over-or under-inflated may suddenly fail, increasing the likelihood of a crash, according to the National Highway Traffic Safety Administration. Nissan will begin notifying customers of the recall on May 3, 2013. Authorized Nissan dealers will inspect and adjust spare tire pressure, as needed, at no cost to the owner. In the meantime, customers may contact Nissan at 1-800-647-7261 or go to www.nissanextendedwarranty.com/recalls/nissan-recalls.html. Concerned drivers may also contact the National Highway Traffic Safety Administration’s Vehicle Safety Hotline at 1-888-327-4236 or go to www.safercar.gov. The NHTSA campaign number is 13V158000. Nissan first became are of the defect in early March when it received a dealer report of spare tire rapid deflation while stored in the truck. Nissan later launched an investigation, and later determined that the spare tire inflation machine used at the Canton, Miss. plant had a malfunctioning pressure regulator, which lead to the over-or under-inflation of certain spare tires. 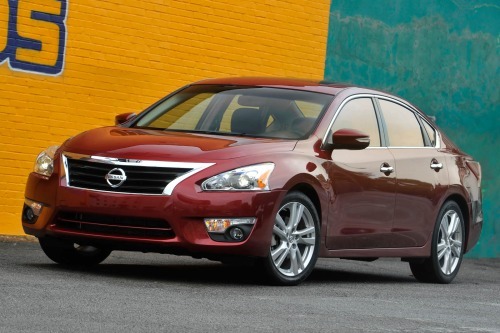 The Japanese automaker also recalled the 2013 Nissan Altima earlier this year over a dangerous airbag issue. The recall, which also impacted 2013 Nissan LEAF, Pathfinder, Sentra and Infiniti JX35 models was issued due to a flaw in the vehicle’s Occupant Detection System (ODS), which may lead to airbag malfunction. In some cases, the passenger airbag may not deploy in the event of a crash, thus increasing the risk of injury. Nissan made headlines earlier this month for a separate airbag recall involving nearly 500,000 vehicles worldwide. The recall concerned 265,000 model year 2001-2004 Nissan Maxima, Pathfinder and Sentra models in the United States, and another 137,000 Nissan Cube, X-Trail, Maxima and Teana in Japan. The remaining 78,000 models were sold in Canada, Mexico and Europe. The vehicles in question may contain a faulty front passenger airbag inflator that may cause the airbags to deploy with too much force. Consequently, the rupturing airbag may send debris flying toward passengers or, in some cases, start a fire. Nissan’s airbag recall came in conjunction with a massive worldwide airbag recall that impacted five other automakers and approximately 3.4 million vehicles. The safety recall also affected Toyota, Honda, Mazda, Pontiac and BMW. The defective airbag inflators came from Takata Corp., a Japanese safety gear manufacturer.